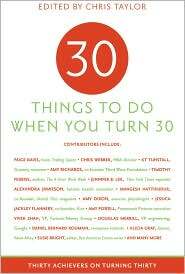 I just got a few copies of the latest book I am in, it is called: Thirty Things To Do When You Turn Thirty, and it’s a collection of insightful essays from prominent thirtysomethings. Lucky I just made the cut! Contributors include singer-songwriter KT Tunstall, bestselling author and my friend Tim Ferriss, NBA star Chris Webber, Trading Spaces’ Paige Davis, Huffington Post blog queen Rachel Sklar, the New York Times’ Jenny Lee, Google VP Doug Merrill, Time Inc.’s Vivek Shah, New York Observer publisher Jared Kushner, Penn State football legend Adam Taliaferro, Paramount Pictures’ Amy Powell, violinist Daniel Bernard Roumain, and many more. It’s the latest in a series from Sellers Publishing, and you can also buy it here at Barnes & Noble. It was great reading my chapter months after I wrote it. WOW, I sure did go through some interesting times – like the Valium-induced haze that saved me from jumping off the Golden Gate Bridge! So, if you have 30-something friends, this is the perfect holiday gift! Looks like a great pick – I’ll definitely check it out!